Your Vision Really Is Relevant! With the end in mind, I created my personal vision statement. I had no idea how meaningful this would be. This vision statement is my north star, guiding and inspiring the direction for my life; defining success for me, and keeping me intentional and on purpose. Having this statement to reference has been invaluable in minimizing stress, simplifying decisions and giving real meaning to my life. A tool that’s lasted 29 years was certainly worth the 30 plus days it took to create. Bringing into existence your life’s vision is a process requiring commitment and discipline. 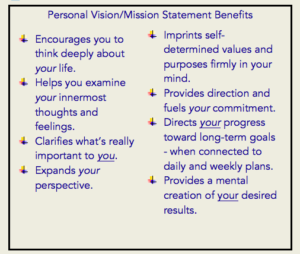 A personal vision/mission statement is a powerful tool that expresses your sense of purpose and meaning in life. It acts as your personal constitution by which you make and evaluate decisions, choose behaviors, and create results. As a first step, transfer what you envision from the mental realm into the physical. You may have heard it said, “Write the vision, make it plain or where there is no vision people perish . . .” There is power in this process! What will be the center of my life? Think about those things you want to build your life around. There are many choices like family, career, spirituality . . . What’s most important is that you identify what will keep you rooted and will be unshakable during life’s twists and turns. What things do I want to have that I feel are important and why? What is it that I am or want to be about? What character qualities and traits do I want to emulate? What’s the legacy that I want to leave? For what do I want to be remembered? Think as if you are writing your obituary. In need of a little inspiration? Try these helpful exercises and resources. Write for 5 continuous minutes in response to questions 1-6 noted above. Keep writing until nothing else comes to mind. Don’t worry about what it looks like. The goal is to get your thoughts on paper. Think one person brainstorming. Review inspirational poetry, quotations, blogs, stories, biographies, and autobiographies. 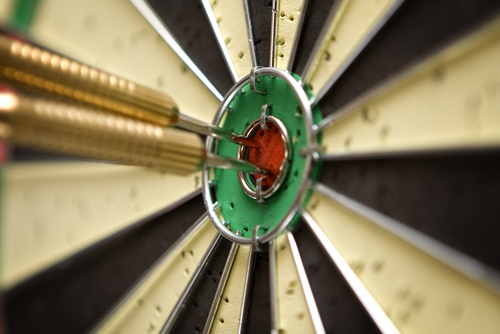 Establish a list of positive character traits that you’d like to develop and live by. Keep a journal to reflect on your passions and the principles & values important to you. The Purpose Driven Life by Rick Warren. 7 Habits of Highly Effective People by Stephen Covey. Represent the absolute best that is within me? Address all the significant roles in my life? 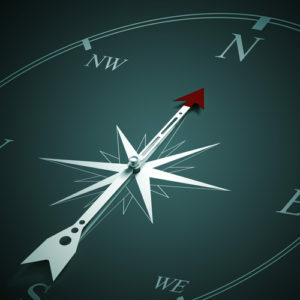 Provide me direction and purpose? Provide me security and comfort? Express timeless principles that produce quality of life results? “Everyone on earth has a treasure that awaits him. But unfortunately, very few follow the path laid out for them — the path to their personal legends and to happiness” – Paulo Coelho, The Alchemist.